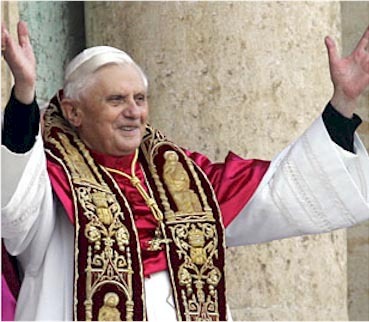 After the Conclave at the Vatican that lasted one day and a half, Cardinal Joseph Ratzinger, aged 78, was elected the 265th pope of the Roman Catholic Church to shepherd over a billion Catholics throughout the world.. He was born on April 16, 1927, in Marktl am Inn, Bavaria Germany, the son of a policeman. During his youth, he was put in a prisoner of war camp for a few months just before the end of the war in 1945. In 1951 Joseph and his brother Georg were ordained priests. Joseph Ratzinger was a theological adviser during the Second Vatican council between 1962 and 1965. He became Archbishop of Munich in March 1977, months later he was ordained a Cardinal by Pope Paul VI. In 1981 he became the Prefect of the Congregation for the Doctrine of the Faith. In 2002, was appointed Dean of the College of Cardinals. He has been known as a defender of the orthodoxy of the Catholic doctrine, a theologian and a philosopher, and has been highly respected for his conservative views. Among his ideologies, he strongly opposes the ordination of women to the Priesthood, the marriage of priests, homosexuality, modern tendencies in the Church and communism. He has been a hard liner unafraid of disturbing political or religious sensibilities contrary to the faith. He is a perfect disciple and apostle of Christ, serving the Master and his Church, prepared to meet controversy but ready to defend our Catholic Faith with his gifted knowledge of theology and with the guidance of the Holy Spirit. During the pontificate of John Paul II, he was his closest friend and adviser, his first words after his election gave credit to the man he has succeeded as Shepherd of the flock of Christ. According to the prophecies of Saint Malachi, he is the pope before Petrus Romanus, who supposedly will be the last pope. Denominated "Glory of the olive", perhaps signifying a time of peace, at least for those who are afraid of losing the orthodoxy of the Catholic Church. He comes at a time when the Church is enjoying the fruits of the previous pontificate of John Paul II, who motivated Catholics to keep the traditional values and encouraged young people to have faith. Thank God we are in safe hands.